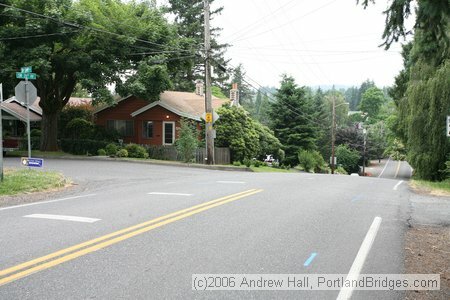 Starting and end point: Multnomah Village. We couldn't just follow the guide book, smile, we modified a bit, by shifting our starting location from a corner of the park to a corner of the street. We were lucky today that it wasn't raining. It started out a little overcast and then burned off before we were done - which was pretty much perfect, in that Oregon kind of way. We walked the edge of some newer homes along one of the uphill climbs we did. (We didn't see this actual house, but I couldn't find a picture of where we were walking.) There were no sidewalks in this particular area and the streets were narrow and twisty. On one of the little hills, we had to decide whether to walk towards traffic so we could see it coming before we were hit, or to walk on the opposite side where we would be more visible to cars coming down the hill toward us before they hit the curve. We didn't get hit, though, and did opt to walk toward oncoming cars. It was a very quiet, off the beaten path, residential street, and there was little traffic. We entered Gabriel Park at the entrance near the community center (which is an amazing space; we didn't go in today, but I have been there a couple of times in the past... it has pretty much everything). We walked past several summer camps, it seemed; past baseball fields and basketball courts, other people walking and jogging. We came to a fork in the road and turned the map upside down so it was matched which way we were walking and made a guess. We walked for a ways, then were confronted with a path leading into underbrush and overgrown shrubbery and we didn't know where we were. The map didn't mention that area. So we decided to get out of the park and head back. Which we did. And we ended up on a very steep hill going up, with a very narrow gravel place to walk which was barely room for one. But we did end up coming out at exactly the spot where we'd parked the car. Unplanned and perfect. We drank some water and left our water bottles in the car as we walked down one more little hill to Marco's Cafe. There we split a sandwich on 12-grain bread and a golden beets, avocado, bing cherry salad with white balsamic vinaigrette dressing. Yummy. Afterwards we walked up that same little hill, which now felt like nothing after a couple of the bigger ones we tackled today, to the car. Three miles of hills and side streets (and a few feet of busy main roads), a refreshing and tasty lunch, and three hours of exercise and conversation with a friend. I returned home satisfied and feeling good. And I finished up another six sentence story I am going to submit, as well as getting the graphic part of a PowerPoint presentation done.